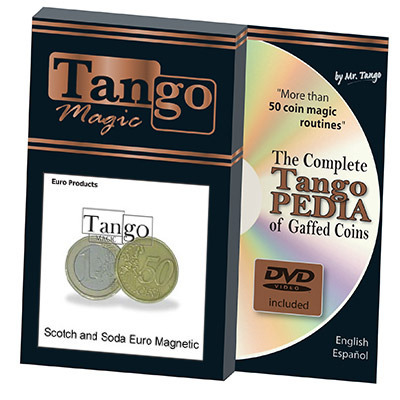 Today, when you order "Scotch And Soda (Magnetic) by Tango", you'll instantly be emailed a Penguin Magic gift certificate. You can spend it on anything you like at Penguin, just like cash. Just complete your order as normal, and within seconds you'll get an email with your gift certificate. The magician shows a 50 cent and a 1 Euro coin in the left hand. He closes both hands and when he opens the left only the 50 cent coin can be found because the 1 Euro coin has appeared in the right hand! The magician shows a 50 cent and a 1 Euro coin and places them in the hand spectator. 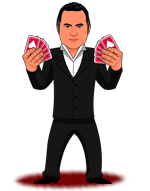 The magician then asks the spectator to put their hands behind their back and pass a coin without looking. Then he asks the spectator to open the hand with the 50 cent coin and amazingly, there is a 50 cent coin! But the magician opens his hand only to find a 1 Euro coin! The 50 cent coin has vanished!! The magician shows two coins; a 50 cent and a 1 Euro, and places them on a pad or tablecloth. He then waves his hand over them for but a second and uncovers them only to find one coin! When he lifts the pad/tablecloth, the 50 cent coin is revealed!! THE BEST SCOTCH AND SODA THER IS, REAL AMAZING EFFECTS. LEAVES THE AUDIENCE SPEECHLESS.